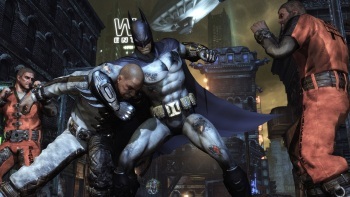 Warner Bros. is having trouble tracking down a glitch in Batman: Arkham City, so it's asking the community for help in the search. Batman: Arkham City is an excellent game, but if you're playing it on the Xbox 360, you should be aware that there's a problem. Some 360 users are reporting that saved games on the console are randomly disappearing, even though the data still shows up on the Xbox's actual hard drive. Warner Bros., however, can't find the problem, and it's hoping that community members can help figure out what's causing the issue. We would very much like to fix the "disappearing save files" issue some consumers have been reporting with the XBOX 360 version of the game as quickly as possible. Thus far our QA department has been unable to reproduce this issue. For those of you who are experiencing this particular issue, it would be invaluable to our QA team's ongoing test efforts if you can contact WB Games Support ([email protected]) and let us know some specifics as to the hardware and software configuration of the XBOX 360 machine you are playing the game on. Exactly how widespread this issue is remains to be seen. Based on comments in the forum thread, it certainly looks like the problem is affecting a number of 360 gamers. If you've encountered the glitch, drop the folks at Warner Bros. a line and see if you can help them solve this.